Masada is the name for a site of ancient palaces and fortifications in the South District of Israel on top of an isolated rock plateau, or large mesa, on the eastern edge of the Judean Desert overlooking the Dead Sea. Masada became famous after the First Jewish-Roman War (also known as the Great Jewish Revolt) when a siege of the fortress by troops of the Roman Empire led to a mass suicide of the site's Jewish Sicarii fugitives when defeat became imminent. Masada is both recognized for its Roman fortifications and as a symbol of Jewish cultural identity. Before thinking you are about to see a major Jewish site, note that Masada is a Roman ruin all in all, the only exception being a synagogue converted from a stable by the Jewish rebels. Despite Josephus' claim that Masada was first occupied by the Hasmonean, no archaeological finding can support such claim and the current consensus points to Herod founded the site as a fortified palace between 37 - 31 BC. Many have even cast doubt on whether the mass suicide by the Jews had in fact occurred, pointing to the fact that Josephus couldn't possibly have known what had transpired since he was based in Rome at the fall of Masada, this compelling story nonetheless has taken a life of its own. This was a major source of national pride during the first decades of the founding of Israel, a myth that rallied a newfound nation-state to not let its precarious homeland to fall again. Whatever really happened during the Jewish revolt, blessed with a dramatic setting and a well-preserved core, Masada is well worth a visit. Being able to also see the Dead Sea from a bird's-eye view is just icing on the cake. Masada is undisputedly one of the must-see places in Israel, and, in my opinion, the best WHS in that country, after Jerusalem. 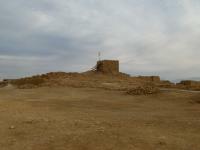 There are two access points to the fortress – western and eastern. Be careful which one you want to reach, as the distance between them is more than one hour by car. At the eastern one you may choose a cable car or 45-60 min hike, while at the western only hike is available, but the path is much easier and takes up to 20 minutes (it is not difficult and my 3-year-old son was able to climb it by himself). Masada is a really well-preserved 2000-year fortress. If most of the buildings had roofs, it could almost look like a fully reconstructed place. Even some original mosaics remained to this day. And the sights from the top of the mountain – at Judean desert and Dead Sea - were really marvelous. The bonus – to the joy of my son – was a domesticated ibex, who was not afraid of tourists and stood still posing to photos. Although Masada is a bit distant from other tourist spots in Israel, I highly recommend visiting it, especially when combined with Dead Sea. I have been to Masada 3 or 4 times the first with a tour party, the remainder with me acting as the guide for friends and colleagues and always during the Summer months. I would always recommend the walk up (take plenty of water) and allow plenty of time to wander. It is imposing, it is much larger than perhaps you would surmise from below, but equalkly there is not much shade. However, take your time and see the different areas between the many tourist groups. I would recommend trying to get there either very early or go up for the last few hours of the day and wait until the number of people have fallen away. And if the people startgetting on your nerves look out at the views which on a claer day are outstanding. Masada holds a special place in the hearts of the Jewish people. It was there, in the first century A.D. the Jews made their last stand on Masada, in the end deciding to commit suicide rather then be captured. Because of this, Israeli army cadets take an oath of allegiance when the join the army, on Masada, with the word "Masada shall not fall again!". I was lucky enough to see one of these ceremonies during my trip, quite a site, many uniformed soldiers with guns, in the midst of 2000 year old ruins, the Israeli flag flapping in the breeze. Dawn at Masada is very special, the light coming up over the hills, makes the stones glow with a radiance of their own. the ruins themselves are fairly standard of the middle east, what makes them impressive is that they are on a massive mesa in the middle of the desert. its hard to see how they could move all the material needed to build the fortress/palace complex. The Highlight of my trip to Masada, was looking over the edge, a viewing all the way down. The second highlight was the bathhouse, very nice mosaics. 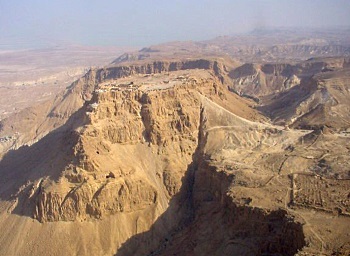 interesting fact: if you yell from the top of Masada, you can be heard at the bottom. but if you yell from the bottom, you can't be heard at the top. So during the siege, the Jews would rain down insults on the romans, who where unable to reply. I too loved Masada on my visit in Nov. 2006. It was one of my favorite places that I visited during my trip to Israel. I would love to go back again. The gift shop was excellent. I bought several items and was wondering if anyone knows if they have a web-site that you can order things from on-line. I bought some beautiful jewelry and would love to purchase more for gifts. My cousin bought me the DVD of the movie, Masada, starring Peter O'Toole. It's a good visual teaching tool. Zillions of sightseeing tours can take you from Tel Aviv or Jerusalem to Masada and it is actually the most convenient way to visit the site. It’s an interesting piece of Jewish history to be told here, but not the most interesting of World Hertitage sights. Once up on the mountain you realise easily that it was virtually inaccessible for the Romans, who needed more than two years to concur it and when they finally did, all Jewish people had then committed mass suicide. Make sure that your “tour” also includes a visit the Dead Sea. Wheather you want to roll yourself in healthy mud or just walk along the salty beaches is up to you but don’t miss the opportunity to visit a unique piece of nature. The Dead Sea is located -400 meters below sea level and the water contains over 25% salt. Make sure you have not shaved before you jump into the water…! Whilst non Jews might not be fully aware of the history surrounding the event for which Masada is most famous they will have come across the word “Zealot”. These were anti Roman rebels who, during their final stand at the fortress, committed suicide rather than fall into the hands of their captors. The Masada Fortress is at the top of an imposing 440 metre high “battleship” of a crag which stands apart from other hills close to the Dead Sea. It is eminently defendable. Today its grandeur is perhaps slightly diminished by the huge car park and the cable car which takes many visitors to and from the summit. There is a footpath however (not difficult) which would qualify you to wear one of the “I conquered Masada” T shirts if you were so minded! The view from the top over the Dead Sea is very fine and there is enough left of the excavated “buildings” to give a reasonable picture of what existed at the top. The site is well worth taking in if you are in Israel. Table Mountain: "The cliffs on the east edge of Masada are about 400 m high and the cliffs on the W are about 91 m high; ...... The top of the plateau is flat and rhomboid-shaped, about 550 m by 270 m" (wiki). The mountain is a "horst" - a "raised fault block bounded by normal faults or graben"
Lowest (below sea level): Its summit is 59m above sea level but the boundaries on the Dead Sea side at least are lower than -200m. Nabatean culture: Nabatean pottery was found, probably due to Nabatean involvement in the siege over Masada. Byzantine Empire and Civilization: a Byzantine monastic community took over the ruins of the Jewish city and lived there till Arab occupation. Cultural sites rejected for Natural criteria: There was an attempt for Masada to be nominated for natural values as part of the Great Rift Valley. 213 Community Members have visited.